Chemical Structure of 9,10-Bis(2-naphthyl)anthrace (ADN); CAS No. 122648-99-1; Chemical Formula C34H22. 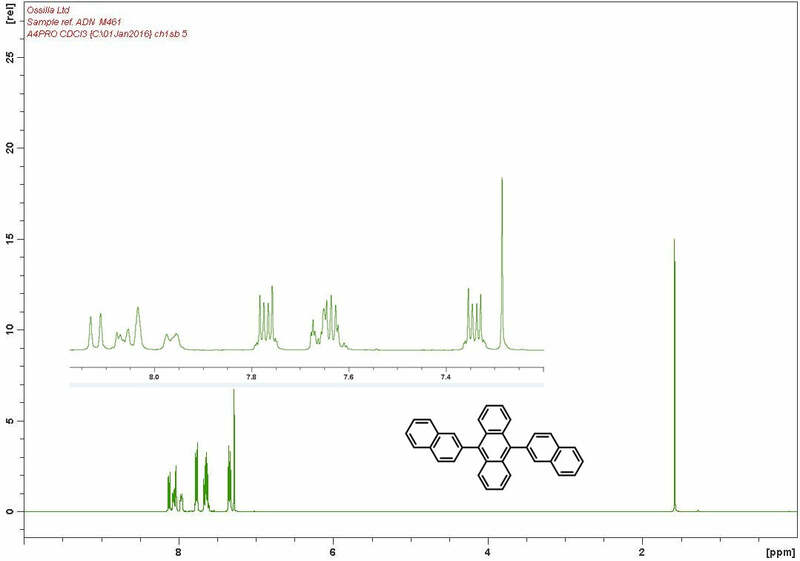 9,10-Bis(2-naphthyl)anthracene (ADN), which is well known for its high thermal and morphological stability, is widely used as the host material for blue OLEDs [1, 2]. However, with the development of the co-doping technology*, 9,10-Bis(2-naphthyl)anthrace has also shown to be a promising host material for full colour OLEDs due to its wide energy band gap [3, 4, 5]. *The co-doping system is a novel technique for colour tuning and increasing the emission characteristics of OLEDs, and the two-step energy transfer in this system plays a very important role in colour tuning and improvement of the device performance. 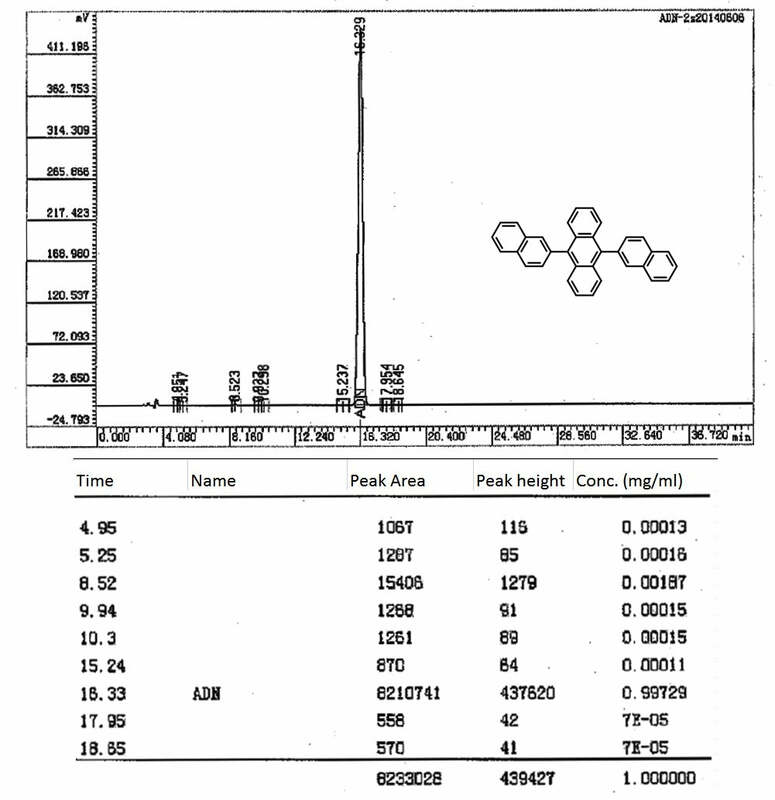 HPLC trace of 9,10-di(2-naphthyl)anthracene, ADN. Anthracene derivatives for stable blue-emitting organic electroluminescence devices, J. Shi et al., Appl. Phys. Lett. 80, 3201 (2002); http://dx.doi.org/10.1063/1.1475361. Highly Efficient and Stable Red Organic Light-Emitting Devices Using 9,10-Di(2-naphthyl)anthracene as the Host Material, H. Tang et al., Jpn. J. Appl. Phys. 46 1722 (2007), http://iopscience.iop.org/1347-4065/46/4R/1722. Green organic light-emitting diodes with improved stability and efficiency utilizing a wide band gap material as the host, H. Tang et al., Displays, 29 (5), 502-505 (2008), doi:10.1016/j.displa.2008.05.001. Improved efficiency for green and red emitting electroluminescent devices using the same cohost composed of 9,10-di(2-naphthyl) anthracene and tris-(8-hydroxyquinolinato) aluminum, J. Zhu et al., Physica E, 42 (2), 158-161 (2009), doi:10.1016/j.physe.2009.09.020. Blue and white organic electroluminescent devices based on 9,10-bis(2′-naphthyl)anthracene, X. H. Zhang et al., Chem. Phys. Lett., 369 (3-4) 478-482 (2003), doi:10.1016/S0009-2614(02)02042-0. Efficient and stable single-dopant white OLEDs based on 9,10-bis (2-naphthyl) anthracene, S. Tao et al., J. Luminance, 121(2), 568-572 (2006); doi:10.1016/j.jlumin.2005.12.053. Highly efficient blue organic light-emitting diodes using dual emissive layers with host-dopant system, B. Lee et al., J. Photon. Energy. 3(1), 033598 (2013), doi:10.1117/1.JPE.3.033598.